My pork, right off the smoker. Looks great! Kinda looks like ya dusted it with powdered sugar from the slight glare! Cool effect! It did have kind of a weird reflective glare coming off the glazed BBQ sauce and the fluorescent lights in my kitchen. Alright I've got kind of a personal question for y'all. 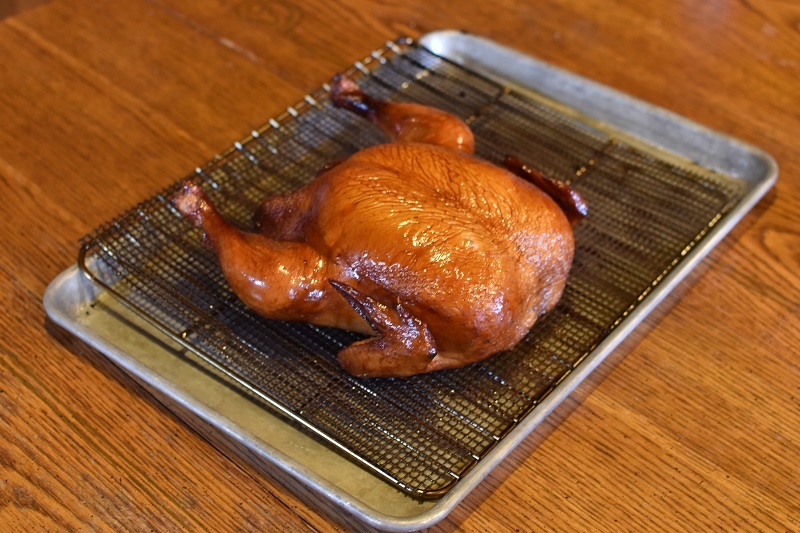 When you grill/smoke your chicken, do you spatchcock? If by chance any of y'all aren't acquainted with spatchcocking, here is a short introduction. I've don't that. Not for slow smoking in particular, but to speed up grilling time and get it more even cooking time. Usually I'm lazy and just split them. Well I got lazy and distracted, and ended up smoking my bird whole. It turned out ok though, nice and juicy with a good flavor from the brine. Edited by Juthro, 17 October 2017 - 02:20 PM. Thank you brother. It sure did taste that way. I'm actually in the process of boiling down the carcass and a bunch of veggies from the garden to make some smoked chicken stock. Then I'll can it up into pint jars. I'm figuring on about a 1/2 gallon of stock (4 pints). Way healthier then that stuff they try and sell me in the store. Love home made stock. I used to smoke or at least grill the bones whenever I deboned chicken or even pork chops, then use the bones for stock. Also celery carrots and onions charred and smoked I've used for stock. That's a good idea jkdeth, thank you! I've charred tomato's, onions, and peppers for more flavor when making tomato sauce, but never for my broth. Man, just found this thread! I guess that's what happens when you're away for a few years. I have been curing and smoking for a few years now. Smoked eggs sound REAL good. Gonna have to try that one. I always cold smoke because I cure everything. One thing that really freaked me out was bacon on a stick. Just ribs cured for two or three weeks then smoked for six hours or so. Tastes just like it sounds. Make lots because "You just can't eat one!" So far I have made bacon of all kinds, hams from butts, picnic, shank and the rump, pork hocks, pastrami and goose breast pastrami. Tha's all I can think of right now. I have an old industrial oven that I use for my smoker with an AMNPS. No need for a mailbox as it is big enough to put 4 whole hams in. By the way, nice mailbox setup, Juthro. Thanks for the bump Mushit! I have some stuff especially pics that would go well here, I forgot about this thread as well. Oooh I'm gonna try those bacon sticks for sure. Ya, you will love them, Mikey. I just cure them in a simple brine for two weeks with 1 gal water, 1 heaping tbsp cure #1, 1/2 cup salt, 1/2 cup sugar and 1/2 cup brown sugar. 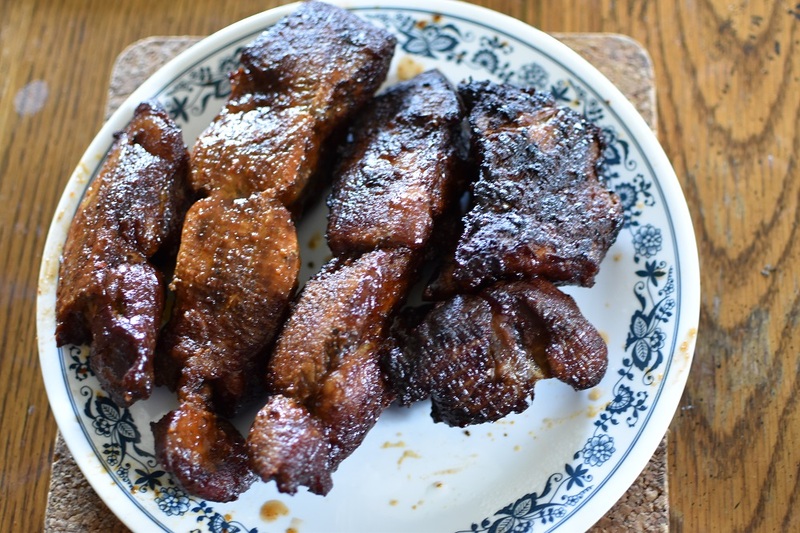 The last batch I smoked with hickory. Mmmmmmm. I am drooling now!! Damn and just waisted two racks last night with plain ole rub on the pellet grill. I could have done the bacon sticks. ah well, they were still good and there are no leftovers to take pics now darn it. Edited by coorsmikey, 15 January 2019 - 09:58 PM. I've been thinking about getting me one of them fancy pellet grills..... Maybe someday. What kind are you running, if you don't mind me asking? I have to agree with Juthro on that one, Mikey. No such thing as a waste when yur smokin'. Juthro, I was a good boy and obviously missed when I was in Alaska. When I got back to MT Santa brought me a Treager Elite series. That was two years ago and nobody around here has any complaints. You just have to fill it up every time to get the best gas mileage for yer pellets. You would most likely need the insulated blanket to go with it, I use it almost every day. Edited by coorsmikey, 17 January 2019 - 08:32 PM.